I'm heading out to a new WMA to hunt tomorrow. Its not the first time I have been there, but it is the first time I have been there this year. I won a quota hunt which gives me a few days to hunt on this particular piece of property. I'm not very hopeful that I will kill a deer, I did not see one on this property all last year, but it is worth a try and I have been meaning to get out there to do some scouting for fox season. As is my habit, I looked up the regs for this area. Everywhere I hunt seems to have different regulations. I'm glad I did. I had assumed it was still bow season in this area, but I was wrong. Regular gun season had already started. This means I will need to wear blaze orange. I don't mind wearing blaze orange, but had I not checked the regs I would have unknowingly broken the law. This is not the first time I have been surprised by an oddball season or regulation. This is the map showing you the different seasons for gun deer hunting in Virginia. Each color is a different set of rules. I live in the tidewater region, but I sometimes hunt farther to the west. This means in the course of one gun deer season I need to consult five different sets of rules. This does not include bow season, muzzleloader season or quota hunts which have their own sets of rules. Also, don't forget the other game animals, each with their own set of rules depending on where you are at. I'm not a dumb person, but this is confusing! I remember when gun season was gun season. All you had to worry about is getting your license and following one set of rules. Now even getting the license is complicated. This year I purchased a general, big game, muzzleloader, and crossbow license, a state stamp, a federal stamp, and got a HIP number. I don't mind paying at all, in fact I basically just buy everything whether I need it or not, just to be safe. There are a couple guys I am trying to get into hunting. When I explain the rules their eyes just glass over. I know one guy who tried to follow the rules, messed up a bunch of times, and now just says "screw it" and doesn't even read the regs. This is the wrong attitude and I do not hunt with him any longer, but it is telling. If I am reading the VDGIF budget correctly, more money is spent on administration than actual game management in Virginia. I believe that the rules are so complex because it is easier to make rules than actually manage the game system. I don't see a solution. Bear season is much less complex. I could deal with deer seasons like this. Don't get me wrong, I understand there needs to be different rules for different areas. 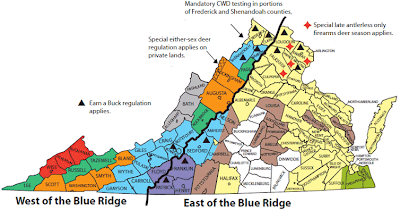 East and west Virginia are totally different hunting areas, but do we really need 32 different sets for deer hunting regulations (my count could be off, it is complex) in one state? The moral of this story is check your regulations closely and express to your states department of fish and game your frustrations. I e-mail the VDGIF regularly asking them to clarify rules, if we all did this I'm sure they would get the point.